According to a press release, the piece originally aired on MVY Radio’s Sunday morning public affairs show, “The Vineyard Current,” in March 2018 on WMVY, 88.7FM. Martha’s Vineyard Regional High School students Amelia Simmons and Rachel Salop and M.V. Charter School senior Keith Chatinover spoke about the upcoming high school student walkout, one month after the Parkland, Fla., school shooting. 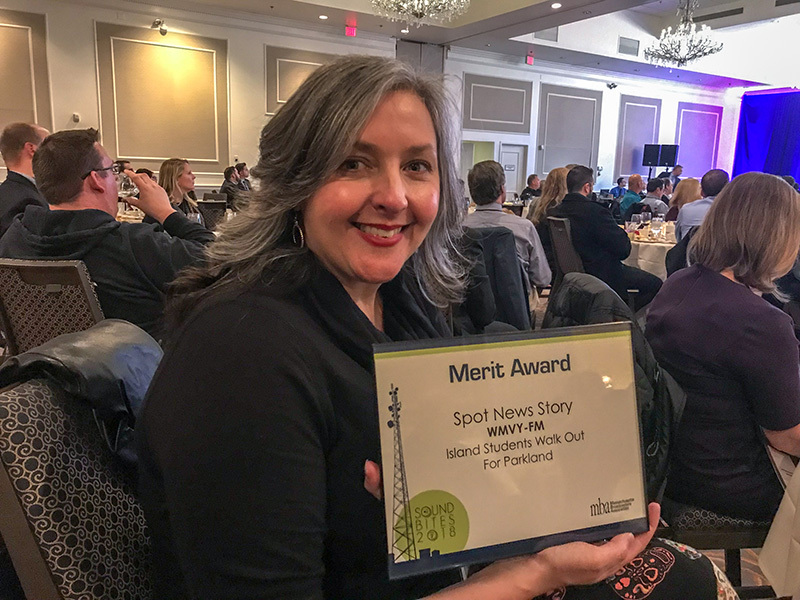 Redington’s segment won the Merit Award for Spot News. Redington won Massachusetts Broadcasters Awards in 2016 and 2017. Since joining WMVY in 1991, Redington has held various roles at the station, but since March 2017 she has worked in a position she initiated, MVY Radio community outreach director. She focuses on creating programming for the station that benefits the community, and she serves as a liaison and emissary to local nonprofits and other organizations to help MVY Radio better serve the Island.